The ATV Logic Deluxe U-Shaped Rack Pack has a wrap around design that will fit onto most ATV racks front and rear easily and securely. 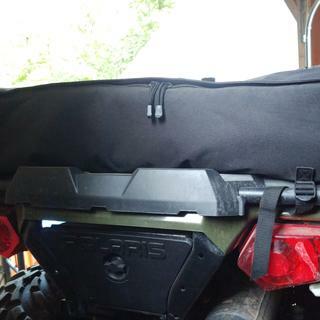 The ATV Logic Deluxe U-Shaped Rack Pack has three spacious compartments, two in which are lined as a cooler that will hold gear, food, water or what ever you might need on your ride keeping it dry and secure. The ATV Logic Deluxe U-Shaped Rack Pack is lightweight and perfect to have on your ATV. The Deluxe Rack Packs wrap-around design fits most ATV front and rear racks perfectly. 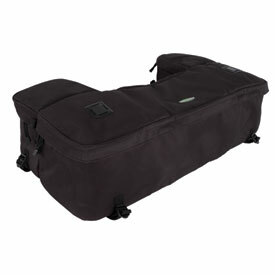 Three spacious padded and lined compartments, each with separate zippers, holds lots of gear. Secures easily to ATV racks with the four straps and ladder lock buckles. Constructed of rugged, water resistant 600 denier polyester. Large 3200 cubic inch storage capacity. It fits my machine very well and it's not to big like many others. The only real bad thing is that the zippers are very difficult to operate once they get dusty. Great product for the price. Just returned from 5 days and 400 miles on WV. HMT. Held up good. Small insulated compartments work well with ice packs for lunch on the trail. A great quality bag for the price. This bag fit very well and easy to install. The overall make and material of the bag was great . It is a great quality bag for the price. Everything works as it should.I would definitely recommend this to others. So far I like everything about this product. It's everything I had hoped it would be. I was trying to find a rack bag similar to one I've been using for years that finally wore out. (mfg unknown). This bag is exactly what I was looking for and the layout is great. I carry gloves, goggles and other need to get to easily type items in the small pockets and a tow rope, rain gear, and such in the large center area. This pack attaches easily and has plenty of room for supplies. 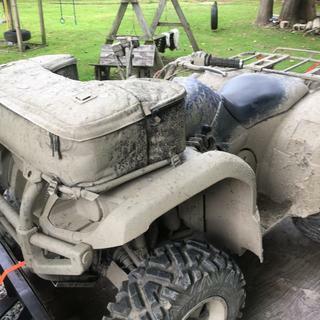 It fits both ATV and Trike motorcycle. Everything good as usual and as expected! This pack attaches easily and has plenty of room for supplies. Its shape fits perfectly on my quad. After about a year the zippers pulled apart and some of the straps ripped off. The compartments on the sides are nice for drinks but don't put crushed cans in them. Its a good design but not durable at all. Nice bag for the price. Plenty of room. Nice to have coolers for drinks. Bag is NOT waterproof, but does keep dust out and light rains. After about 3 years of use, zippers wore out. I bought a another bag. Bought this bag and am very disappointed, after 3months the seems and zippers pulled apart. Also not water proof. Got caught in rain and everything got wet. I liked the features of this pack (two small coolers built into the front corners) but was very disappointed with the quality. After only two rides the seams started pulling apart. 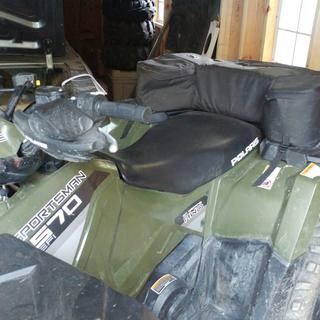 Would this fit a 2018 Polaris 570 touring model with the seat rest on? BEST ANSWER: It probably won’t fit with the rest on. It takes up the whole rack on my 2017 sportsman 1000 xp.